Fixed assets are some of the most important investments your company makes. Why would you consider their values with estimates or guesses when it comes to your company’s financial management? With faManager fixed asset tracking software, the guesswork is gone. Your bank, your accountants and your shareholders will appreciate you. Perfect for managing a large fixed asset base, whether it’s equipment and systems, rolling stock or bricks and mortar. Keep track of all of your assets quickly and easily. faManager fixed asset tracking software takes locations seriously. Users can set up their own list of locations which can then be selected from a drop-down every time an asset is set up. And if an asset is moved from one location to another? No problem. Simply edit the asset, access the drop down, and chose the new location of the asset. Simple. In addition to faManager’s incredible accuracy, it is designed to find assets in your database at lightning speeds. You can search by serial numbers, parts of serial numbers, parts of descriptions…search on almost any aspect of an asset, and find it in your records, quickly. This is a key area where many other software packages fail, and where faManager absolutely shines. This is what makes faManager very attractive for small companies and multinational companies alike! faManager fixed asset tracking software was born on the idea of tracking serialized inventory. The recording of serial numbers or Vehicle Identification Numbers (VINs) is a specialty of faManager. With the powerful search capabilities of faManager, you can search assets by any part of a serial number or VIN and find what you’re looking for. By recording specific serial numbers or VINs, you can rest assured you’re disposing of the right asset. As the CFO for a telecommunications company, organization and access to our fixed assets was of utmost importance. We had tried numerous other fixed asset software programs, but they were either overly complicated, offered poor performance, or simply just did not give us the information that we required. That is why we were so excited to begin using faManager. This web based program is powerful, easy to use, and most importantly, gives us the information we need. We now have total access to all our information in the blink of an eye, and the use of the program in a day to day setting is seamless. Adding, changing, and disposing of assets takes no time at all. The software is intuitive, and the team at Cloudtric Inc is more than willing to help if we have questions. 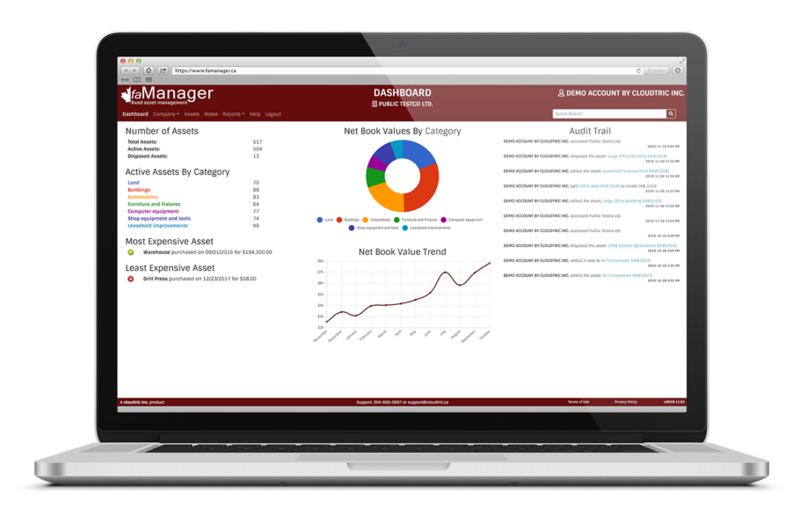 As we have a group of companies that require fixed asset tracking, we look forward to using faManager for years to come. We strive to get back to you within 24 hours on regular business days! Enter your information below and we will e-mail you login information for a demo account!